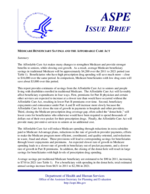 This Issue Brief provides estimates of Medicare Parts A, B, and D savings from the Affordable Care Act to seniors and people living with disabilities enrolled in traditional Medicare. The Affordable Care Act will favorably affect beneficiary expenditures in four ways: lowering part B premiums growth, lowering beneficiary copayments and coinsurance growth under Part A and B, closing the Medicare prescription drug coverage gap, and providing many preventive services to seniors at no additional cost. The study estimated the savings to beneficiaries from these effects for the 2011-2021 period. The Affordable Care Act makes many changes to strengthen Medicare and provide stronger benefits to seniors, while slowing cost growth. As a result, average Medicare beneficiary savings in traditional Medicare will be approximately $4,200 over the 2011 to 2021 period (see Table 1). Beneficiaries who have high prescription drug spending will save much more close to $16,000 over the same period. In comparison, Medicare beneficiaries with low drug costs will save about $3,000 over this period. This report provides estimates of savings from the Affordable Care Act to seniors and people living with disabilities enrolled in traditional Medicare. The Affordable Care Act will favorably affect beneficiary expenditures in four ways. First, premiums for Part B physician and certain other services are expected to increase at a slower rate than would have occurred without the Affordable Care Act, resulting in lower Part B premiums over time. Second, beneficiary copayments and coinsurance under Part A and B will increase more slowly because the Affordable Care Act slows the rate of growth in payments to hospitals and other providers. Third, closing the Medicare prescription drug coverage gap, often called the donut hole, will lower costs for beneficiaries who otherwise would have been required to spend thousands of dollars out of their own pocket for their prescription drugs. Finally, the Affordable Care Act will provide many preventive services to seniors at no additional cost. The Affordable Care Act will reduce Medicare spending through reductions in extra subsidies paid to Medicare Advantage plans, reductions in the rate of growth in provider payments, efforts to make the Medicare program more efficient, coordinated, and quality-oriented, and reductions in waste, fraud and abuse. These provisions will lead to corresponding savings for beneficiaries through lower copayments and premiums. An expected slower rate of growth in Medicare spending leads to a slower rate of growth in beneficiary out-of-pocket payments, and a slower rate of growth in Part B premiums. In addition, the closing of the donut hole will result in large savings for beneficiaries with high levels of prescription drug spending. Average savings per traditional Medicare beneficiary are estimated to be $90 in 2011, increasing to $710 in 2021 (see Table 1). For a beneficiary with spending in the donut hole, total estimated annual savings increase from $631 in 2011 to $2,386 in 2021. Changes in premiums and cost sharing will also occur in the Medicare Advantage program. The Affordable Care Act will reform this program, gradually eliminating excessive payments to health plans, rewarding quality, and improving protections for beneficiaries against overly high cost sharing. The most recently available data on Medicare Advantage plans suggest that premiums have fallen by 7 percent on average, and enrollment has risen about 10 percent since this time last year. This memo was prepared by analysts in the Office of the Assistant Secretary for Planning and Evaluation (ASPE) in consultation with the Office of the Actuary (OACT) of the Centers for Medicare & Medicaid Services (CMS). The savings for traditional Medicare beneficiaries from reduced Part B premiums, reduced Parts A and B coinsurance and copayments, and from increased Part D premiums were estimated by OACT. Savings from reduced Part A and B coinsurance will vary across beneficiaries. Beneficiaries with multiple chronic conditions, those using a higher than average volume of services, as well as those who make greater use of preventive services, will enjoy a greater than average amount of savings. The estimated effects for beneficiaries not in the donut hole are shown in Table 2. The Affordable Care Act requires drug manufacturers to provide a discount for covered brand name Part D drugs sold to seniors in the donut hole (50% starting in 2011) and later provides subsidies for covered brand name Part D drugs to those beneficiaries rising from 2.5% in 2013 to 25% in 2020. Finally, the Affordable Care Act provides subsidies for generic drugs purchased in the donut hole beginning at 7% in 2011 and rising to 75% in 2020. Together, these changes mean that a beneficiary will pay the standard 25% coinsurance in a standard plan in 2020 for generic and brand drugs, and the donut hole will be closed. In 2011, nearly four million seniors and people with disabilities in Medicare Part D received $2.1 billion in discounts on prescription drugs in 2011 when they hit the donut hole coverage gap, for an average of $604 per person. These discounts, which beneficiaries received automatically under the Affordable Care Act, will continue to grow through 2020 until the donut hole is fully closed. The Affordable Care Act also lowers the rate of growth of the out-of-pocket threshold for drug spending by beneficiaries in the donut hole from 2014 to 2019. We estimate savings to beneficiaries from this change using a combination of information from OACT and results from the analysis described above. The estimates are presented in Table 3 below. For beneficiaries with spending in the donut hole, total estimated Parts A, B, and D savings increase from $631 in 2011 to $2,386 in 2021. Part D estimates incorporate 3 effects: (1) savings due to filling the doughnut hole, (2) savings due to reducing the growth rate of the catastrophic threshold during 2014-19, and (3) an offset from increased part D premium. Memo by John Shatto, Director of Medicare & Medicaid Cost Estimates Group, CMS Office of the Actuary, October 5, 2010. In a memo from Richard Foster, April 22, 2010; Table 3, sec 1101, OACT estimated that the cost to Medicare from the slower growth in the out of pocket threshold was approximately 11% of the cost to Medicare from closing the donut hole. We apply this 11% estimate to our estimate of the cost to Medicare from closing the donut hole to estimate the savings to beneficiaries from the slower growth in the out of pocket threshold from 2014 to 2019.